The Likas Lagoon Crocodile: This one is real, unlike the Port Dickson Crocodile! A CROCODILE in Port Dickson! In the sea! Really? Hidden danger: The picture of the crocodile circulating on social media spotted at the Likas lagoon about 3km from Kota Kinabalu. 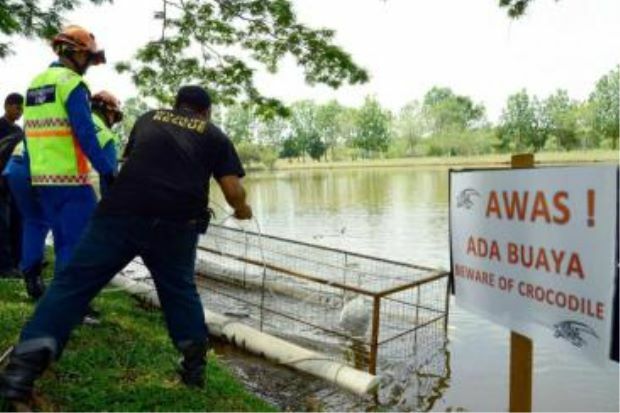 Likas Lagoon crocodile believed to have left lagoon. 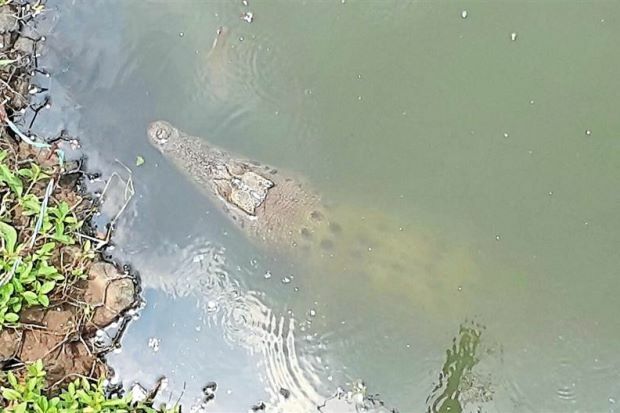 KOTA KINABALU: Sabah Wildlife officials believe that an elusive 1.5-meter long crocodile that was spotted in the Likas Lagoon may no longer be in the area. The crocodile that was last spotted in Sept has so far eluded three traps set by rangers from Sabah Wildlife Department’s Wildlife Rescue Unit (WRU). “We have also heard that the crocodile may have ended up in one of the fishing nets strung up in the lagoon area and whoever found it had taken it home,” said the department’s assistant director Dr Sen Nathan. Sen however said that this has not been verified, adding that the department was keeping the three traps at the lagoon for now. The crocodile was seen at a pump station in the lagoon on Sept 25 by a state Department of Irrigation and Drainage employee. Department director William Baya said they believed this was the same crocodile that had been spotted in the lagoon several months ago. Baya said the department had laid traps that the reptile has avoided, adding that catching the crocodile is a priority as the area surrounding the lagoon is densely populated. 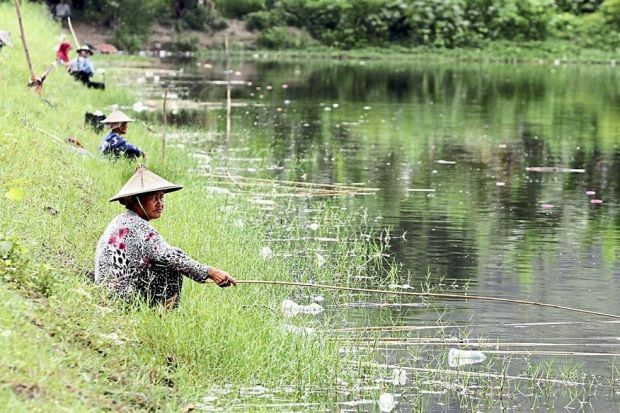 KOTA KINABALU: The presence of a crocodile in the Likas lagoon is apparently no deterrent for anglers to stay away from the area and that is worrying the state Wildlife Department. Nearly 10 anglers, all of whom were women, were seen fishing there on Thursday, barely 100m from where the 4m crocodile was last spotted just two weeks ago. Cyclist Paul Lajumin, who passes through the area, said he has seen people casting their nets there in the evenings. “I asked them if they were aware about the presence of the crocodile and they just smiled. I’m not sure if they realise the risk they are taking,” said Paul. Department director William Baya said the public should stay away from the area until the crocodile was caught. “They should not be there at all,” he said when asked about the presence of the anglers at the lagoon. Catch me if you can: Wildlife rangers setting the trap for the lone crocodile at the Likas lagoon in Kota Kinabalu. 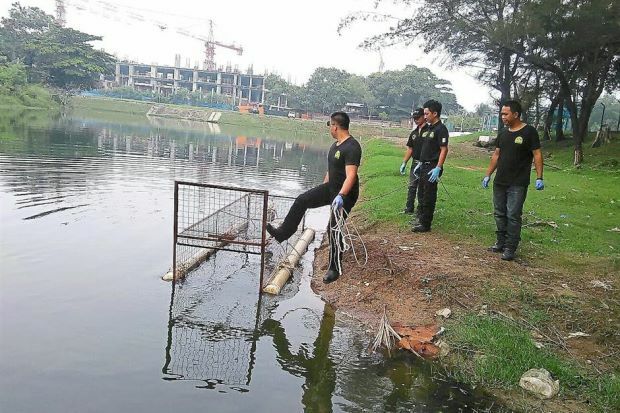 KOTA KINABALU: A lone crocodile in the Likas lagoon near the city’s downtown area remains elusive hours after Sabah Wildlife Department rangers set a trap for it. Its assistant director Dr Sen Nathan said Wildlife Rescue Unit rangers set the trap at a spot near a pump station yesterday where it was spotted a day earlier. “We have to wait for a few days to see if it takes the bait,” he said, adding that rangers would be closely monitoring the trap. The 1.5m long reptile was spotted near the pumping station at about 11am with a photograph of the animal widely circulated on social media. Department director William Baya said wildlife officers be­­lieved that this was the same crocodile spotted in the lagoon several months ago, which had so far avoided all traps laid for it. He said they believed that the reptile could have been washed down from crocodile farms in Tuaran and Penampang near the city during the recent floods. KOTA KINABALU: The Sabah Wildlife Department is on a hunt for an elusive crocodile that was spotted again at the Likas lagoon about 3km from the city centre. Department director William Baya said a team of rangers from his Rescue Unit had set up traps to capture the reptile that was spotted at about 11am near the state Department of Irrigation and Drainage pump station. Baya said this could be the same crocodile that was spotted in the area several months ago. “We also laid traps then, but couldn’t catch the reptile,” he said. He said those who saw the crocodile claimed it was about 1.5m long. Since news of the sighting this morning, a picture of the crocodile has been widely circulated on social media including Facebook and WhatsApp. Baya said catching the reptile was the department’s priority as the area surrounding the lagoon was densely populated. He added that the department had also issued a warning to the people in the area. “We suspect the reptile was washed down during the recent floods from one of the crocodile farms in Tuaran and Penampang,” Baya said. Last week Baya said the number of human-crocodile conflicts statewide had been increasing drastically. A crocodile I filmed in a mangrove last year near Likas River. I believe this is the same crocodile that makes local news headline for its appearance in the lake of Likas Sport Complex. This entry was posted in KK, likas lagoon crocodile buaya and tagged likas lagoon buaya crocodile. Bookmark the permalink. 1 Response to The Likas Lagoon Crocodile: This one is real, unlike the Port Dickson Crocodile!